Did you know that you can easily upgrade your laptop or desktop computers hard drive to a Solid State Drive? By the way, this all applies to a normal desktop PC as well and some MAC Books depending on the model. Here’s how! Why switch? Mostly because it is extremely noticeably faster. They have absolutely no moving parts unlike your typical mechanical magnetic spinning disk hard drives in most computers. The SSD’s also have a much higher read write speed making them truly noticeably faster than a mechanical hard drive. With a Solid State Drive you can generally boot Windows in about 30 seconds or less and running programs is instantaneous. The upgrade is very worth it. Especially if you have a gaming computer. You will always load faster than your friends. The SSD Flash technology makes it ideal for laptops because they are less likely to break after a drop. A mechanical drive would be toast. This all sounds so great but what’s the downfall? 1) They cost much more than a traditional magnetic hard disc drive with mechanical moving parts but that’s how new technology works. Things cost more. However they’re becoming a lot cheaper recently. 2) They are extremely fast at reading data, so like running apps, booting, shutting down, etc, have a much more superior data read rate, however flash memory is actually slower at writing to disk. This means they may not be the best for recording video or movies and what not. If you ask me you can not tell a difference in writing but I do not encode video. My SSD has been the greatest upgrade to my desktop ever. 3) Flash drives are still a fairly new technology, so I haven’t had mine very long(2-3 years). How long will SSD’s last? Intel claims they have a lifespan of up to 5 years. I have some magnetic drives that are much older than that so I hope I don’t have to replace it every 5 years. Also they write in a completely different way and the data loss / recovery is supposed to be a lot harder on an SSD. Maybe there is a new field for this? This does not bother me because I always backup my computer to a network attached storage. As everyone should. The original hard drive has many cons though which pretty much void any SSD cons and make the upgrade a smart idea. The magnetic heads run over the metal platters at high speeds 5400rpm and 7400rpm with an invisible to the naked eye space in between them. This means a slight bump could technically toast your drive so they are way more susceptible to drop damage. You’ll often notice they run very hot too. I do not recommend grabbing a hard drive that has been running at a full 7400rpm for more than a few minutes. They are also much louder in operation. Pretty much the old school hard drives are out and the new SSD is in so be sure to upgrade ASAP. Here are a few reasons you should not upgrade your laptop to a Solid State Drive. Windows XP is actually an older operating system and the technology is not optimized for the new drives. Luckily all new laptops come with Windows 10 which is optimized for Solid State. Some laptops do not have access to the hard drive bay. You can easily tell by flipping it over and unscrewing the area that looks like it’s about the size of a hard drive. If you’re able to open it up and see the drive, you can swap it out. If this holds true it is a risk you take. Generally they want you to pay them a lot more for a laptop that comes with an SSD already installed and it will void your warranty if you put your own Solid State Drive in. So be careful and decide how you want to handle it. I personally void warranties. For a desktop, size does not matter. It will fit in your computer case. For a laptop, look at your old drive to get the right size. Most laptops have the 2.5″ sized HDD but some ultra portable netbooks may have a 1.8″ HDD. Even some common sized 2.5″ hard drives may have a different thickness such as 7mm and 9.5mm. The general rule these days is standard 7mm thickness 2.5″ SSD with SATA adapters will fit in a 9.5mm drive bay. Pretty much this will work for all. Make sure your new drive has enough space for your old hard disk. Because SSD’s can be a bit more costly on the per gigabyte size you gotta make sure you bought a big enough drive to fit it all which is why you need at least 250GB. Now that prices have come down, a 500GB is the best bet but do not go for anything under 250gigs. If you plan on doing a clean Windows install instead of cloning your old drive then be sure to look up your computer drivers and download them ahead of time, especially your network card drivers as these can be hard to obtain if the NIC isn’t working. You do not want to end up there if your laptop is your only computer, trust me. Backup your data first to a networked drive if you have that option. We’re going to clone the original hard drive to the new SSD so that we may hot swap it in the laptop. 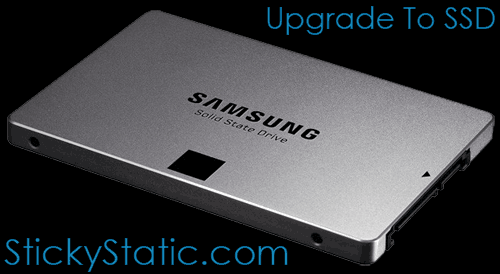 Put the new SSD in the external encasement and follow the steps on cloning here. After cloning the drive you can physically swap it out. This is the easy part. On the bottom side of the laptop it is usually obvious which bay is the right one based on the size of it. Generally you’ll see 2 to 4 very small Philips screws to undo. Be sure not to lose the screws during the upgrade. Do not use a magnetic screw driver! But you knew that. Once you have removed the drive bay cover you’ll notice the hard drive is connected to the SATA cables and you’ll have to gently remove these and reconnect them to your new SSD. Because you’re working with sensitive electronics you’re going to want to ground yourself first by touching something metal to get any kind of charge out. That’s pretty much as hard as it gets. You’re done! Keep the old hard drive around untouched for a while just in case something goes wrong with the new SSD. This way you can hot swap it back in if you need to. Also now that it is in the enclosed hard drive case you can use it as an external drive or backup drive. It’s like this. Upgrade the Macbook to an SSD and save money. Please share by clicking below and comment with your experiences. The biggest downside of getting an SSD is that Microsoft may deactivate all their products from your computer. Products such as Microsoft Office & Microsoft Windows. I have a second hand PC which refuses to activate using a cloned SSD and states through CMD that it cant find the scripts. I believe that major hardware changes may deactivate Windows to protect piracy. Keep hold of your HDD as you may need to reinsert it. Has anyone else had a problem cloning Windows to an SSD? I did not have any such issue but then again, all of my other computer hardware remained the same. I only swapped the hard drive out.